Prominent & Leading Manufacturer from Panchkula, we offer microprocessor colony counter s-961. 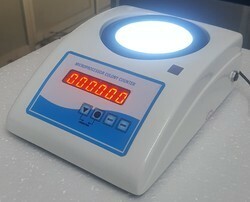 We are offering of Microprocessor Colony Counter. Features: Streamlined design enables fast and accurate count & reduces operator fatigue. Hold function to stop counting at any stage. 40 memory locations with data storage even after the power switch off. Four Digit resettable digital counter with audio beep at every count. Auto mark-Market pen probe, for counting and marking simultaneously. Wolffhuegal grid glass plate. Focusing adjustable. 110 mm Magnifying glass.